One of my greatest blogging regrets is not completely cataloging every strange and ridiculous phase monks went through before they were released with Mists of Pandaria. Monks initially didn’t auto attack? Shuffle was a channeled spell? Roll cost 40 energy? 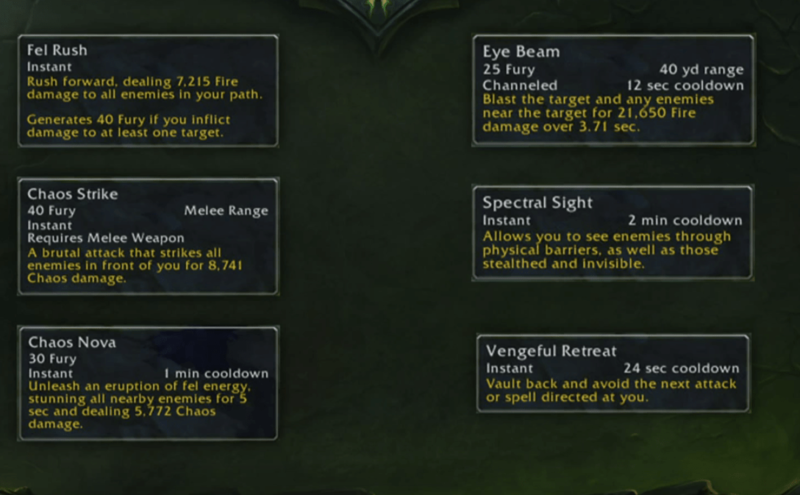 Classes change completely from their initial announcement and I want to archive the changes for demon hunters. Demon Hunter armor exposes muscles and tattoos! Starts out in Vault of Wardens (which is also a 5 man). The wardens release the demon hunters out of desperation because of the impending invasion by the Burning Legion. Before the modern day release, you participate in the events of the Black Temple, where you’re sent off on a mission by Illidan to the world of Var’dum (guessing at spelling). Metamorphosis: Demon Hunters transform into hellish forms, enhancing their formidable powers. Demolish any who stand in your way with fiery demonic attacks. Metamorphosis: Gain incredible swiftness and damage allowing them to finish their prey, and the ability to teleport into combat. 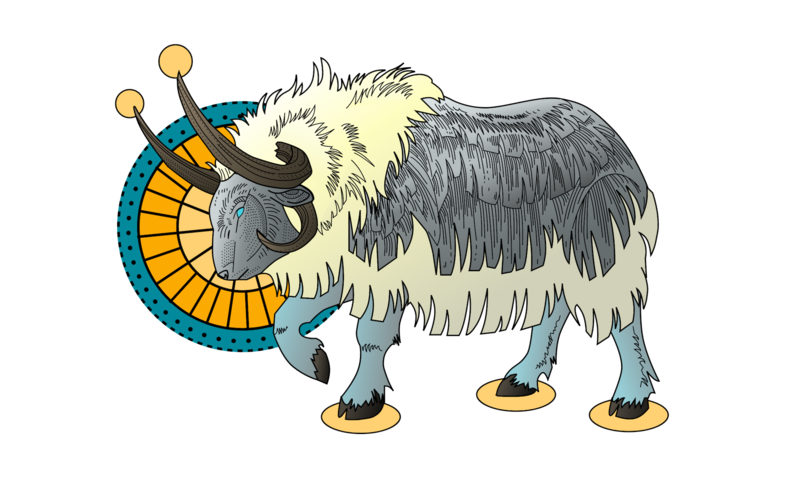 This form has wings and cloven hooves, similar to a Doomguard. Go toe to toe with even the most powerful demons, withstanding massive punishment as their attacks fuel your hatred. Metamorphosis: Become nigh invincible in their demonic forms and grant powerful supportive Auras. This form features toed feet with spikes in the place of wings, and most closely resembles a Wrathguard demon. The chaotic energy that flows within Demon Hunters empowers their physical and magical strikes to devastating effect, possibly implying Chaos damage. Chaos Damage uses all seven types of magic (physical, holy, fire, nature, frost, shadow, arcane) at once, using the lowest resistance among those to calculate damage. It also ignores immunity and absorption effects. Fight demons by using demonic powers against them. They view their demonic empowerment as a sacrifice — they become the thing they hate to protect their friends and family who shun them (it’s very tragic). Gouge out their eyes to gain “Spectral Sight”, which gives them the ability to see demons more clearly. Mana Burn: Sends a bolt of negative energy that burns a target enemy unit’s mana. Burned mana combusts, dealing damage to the target equal to the amount of mana burned. Immolation: Engulfs the Demon Hunter in flames, causing damage to nearby enemy land units. Drains mana until deactivated. Evasion (Passive): Gives the Demon Hunter a chance to avoid attacks. Metamorphosis (Ultimate): Transforms the Demon Hunter into a powerful demon with a ranged attack (60 range) and 500 bonus hit points. Illidan was the first demon hunter, and trained the first demon hunters himself. Illidan got his tattoos and his gouged out eyes / Shadow Sight from Sargaras. Demon hunters start out as normal elves, but gradually their bodies become more and more demonic. Traditionally, becoming a demon hunter requires finding a mentor and following a series of rituals, such as killing a demon and binding its essence to yourself. Then you use a magic blade to burn your eyes out, which somehow traps the demon essence inside. 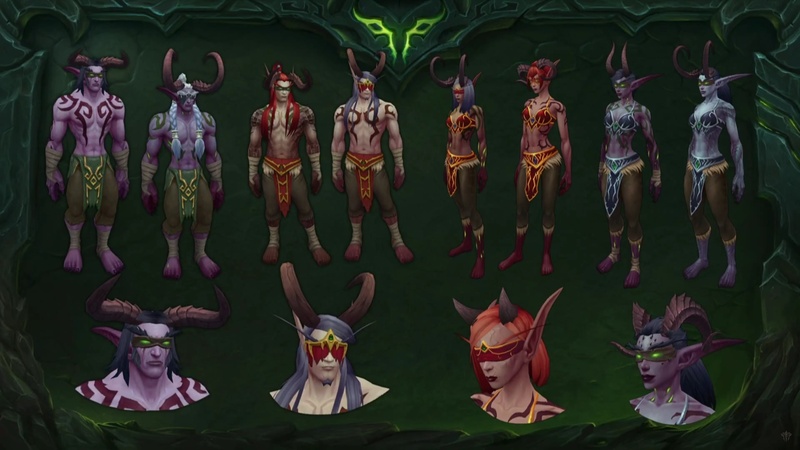 Most demon hunters that have appeared in game so far have worn little more than a leather/cloth kilt and a blindfold. The Illidari, or the faction that follows Illidan Stormrage, doesn’t just include demon hunters. It also includes demons who have defected from the Burning Legion, naga, the Broken, and others.